Back up all of those ideas you jot down on sticky notes in the middle of the night. To that end, Dropbox is releasing one of the biggest updates to its core product in quite some time. 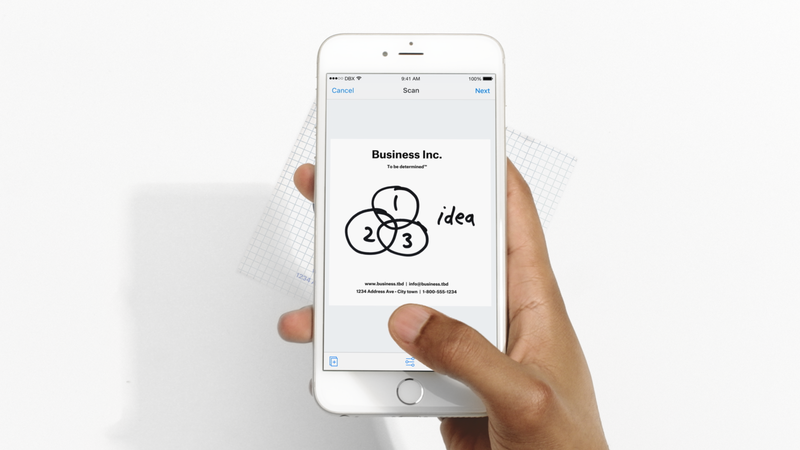 Most of those changes are designed to make it easier to work collaboratively, but the first and perhaps most important update should be useful to just about anyone: The iOS Dropbox app now has an intelligent document scanner built right in. It's not the sexiest feature, but if you've ever taken a photo of various hand-drawn notes, ideas or any scrap of paper you wanted to save digitally, it'll be quite useful. 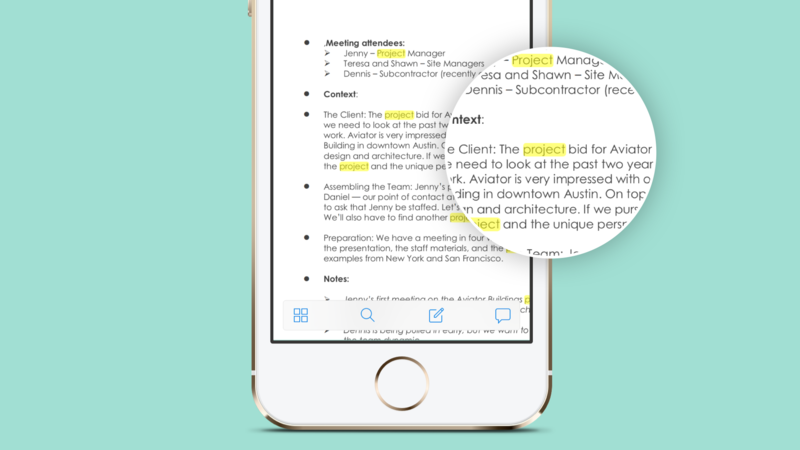 When you tap the shiny new "plus" button inside the app, you'll be presented with the option to scan a document. From there, you'll find yourself in the familiar camera viewfinder mode, except now, when the app detects the outline of a piece of paper, it will highlight it. When you shoot the photo, the extraneous background details are cropped out and the image is presented in a zoomable, high-resolution file that gets saved as a PDF. The Dropbox app is smart enough to include some features to make those files more readable as well. There's a black-and-white theme, contrast adjustments and a "whiteboard" mode that makes it easier to read pictures of marker boards. The app also lets you combine multiple snapshots into a single multipage PDF file. This all worked great in a demo that Dropbox gave, but we'll have to try it out ourselves and see how well it actually recognizes various handwritten notes -- and how those scans look when you're viewing them on your computer. Scanning will be available to anyone using the Dropbox iOS app (the feature will come to Android later), but Dropbox Business users are getting a pretty major addition on top of that. Using optical character recognition (OCR) technology, any image with text you upload will be searchable. So if you're looking for a file with specific words in it, you'll be able to find what you want among your scanned images. Dropbox noted that it only looks for letters and numbers, so there's no way to search your other photos based on their various characteristics. And unfortunately, this feature isn't available if you're a free or Pro Dropbox user. Some notable changes are in store for desktop users as well. When you share files or folders from the Mac Finder or Windows Explorer, you used to get booted to the web to add collaborators, set file permissions and so forth. Now there's a new native interface for sharing files from the desktop. In the demo I saw, it looks like a native extension of the OS and makes it easier to work with shared Dropbox files without having to ever visit the service's web client. In another improvement, you can now share individual files privately with specific people. Previously, if you shared a file with someone, the link that Dropbox generated could then be passed on to anyone else. But now people will need to log in to see files specifically shared with them. Those who use Dropbox's free tier will also have the option to designate view-only access for shared folders rather than have all the files totally open and able to be edited. Commenting is also getting a meaningful update. Comments can now be attached to specific parts of a file: Just drag to highlight a particular area of a document and your comment will show up next to it. Unfortunately, this doesn't work on videos. Comments are attached to the file, but you can't have them refer to specific points or time stamps. 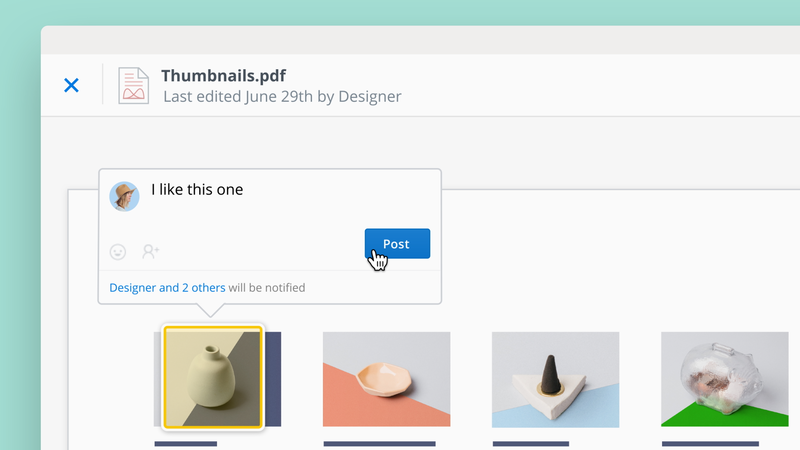 Dropbox also previewed another commenting feature that will arrive in a future update. If you're working in a Microsoft Office file, you'll be able to see and make comments from the Dropbox "badge" that appears when you're working on a file shared with other users. It's another way the company is expanding its products to other apps rather than just keeping it on the web. There's also an update to version history, which has been in the Dropbox product for some time now. Now, when searching back through older versions of files, you can quickly pull up a preview to make sure it's the right version that you want to restore. Last, another feature that is in preview (and thus not part of today's rollout) is called "presence." It lets you see who is viewing a particular file at any given time, who's viewed it in the past and how many times it has been viewed overall. As is often the case with Dropbox updates, none of these are terribly exciting features on their own. But if it works as well as promised, the scanning capability is something that should be handy to just about everyone who uses the service. And all of these additions help make Dropbox more than a simple file locker. As the company likes to say, it's moving from being a product to keep your files and sync to a product that keeps teams and businesses in sync. Again, it's not the most exciting mission out there. But given how continually difficult it is to manage our digital lives (particularly when it involves sharing documents with others), the company's evolution as a collaboration platform makes a lot of sense.